Cruising on the Allure and cycling through a colorful countryside is the perfect recipe for a successful holiday. While you are cycling and active during the day, the boat accompanies you along the river to welcome you at the day’s goal as your swimming hotel. And if you do not want to cycle you can enjoy the tour on board, admiring the passing scenery. First you will cycle through the flat, peaceful, farming countryside of The Netherlands, with the famous windmills along the way. You will cycle through the National Park the Hoge Veluwe with the Kröller-Müller museum. This museum has a world famous collection of mainly 19th and 20th century art. 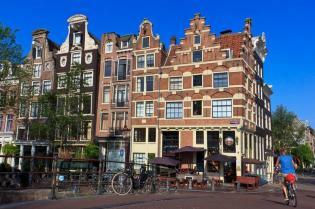 Central to the extensive collection are works by Vincent van Gogh. Later on, in Germany, we follow the Rhine upstream, first through the Ruhr area where Germany’s and probably Europe’s largest industries are housed. 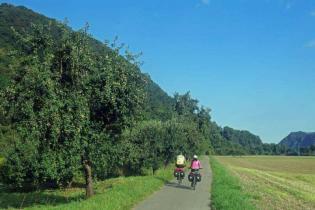 While cycling towards Cologne, you will leave the Ruhr area behind. Cologne used to be one of the most important centers of the Holy Roman Empire. 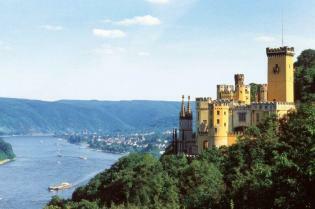 Landmark is of course the Cathedral right next to the railway station and the railway bridge over the Rhine. 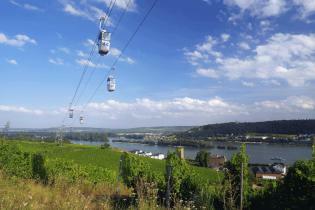 During the second week of this two-week tour a more romantic section of the Rhine valley starts with strongholds, mansions and the first vineyards in the first mid-German hills. A visit of Burg Eltz is on the program. Apart from the beautiful landscape, you will see cultural highlights, art treasures, and you can enjoy regional culinary specialties. From Mainz we will follow the river Main that winds through the diverse countryside of Franconia and Hesse in several wide loops, passing old cities and towns full of historical attractions. Cycling through charming vineyards, orchards and lovely meadows along the bank of the Main River is a great way to end this tour. The Allure started cruising in 1998. Jossie Verkerk, the former owner, redesigned the barge with its sleek lines herself and turned it into a comfortable and friendly passenger barge. From that moment on, the Allure has been successfully hosting boat and bike tours in the Netherlands, Belgium and Germany. Since 2011 the Allure has a new owner: Martien van de Velde. He operates the Allure with new élan. Under his management, the Allure still is a very popular small river barge for boat and bike tours. The Allure has ten comfortable cabins. One double cabin (8 m² – 68 sq.ft.) with a double bed and nine twin cabins (8 m² – 86 sq.ft.) with two single beds which can be set together in most cabins. In two cabins there is the possibility to place a bunk bed for children. Each cabin has a private shower, toilet and basin. Windows can be opened and the cabins have central heating. Furthermore, you will find a mini safe and hair dryer in each cabin. The corridor is air-conditioned, thus also cooling the cabins. The Allure has a cozy lounge (air-conditioned) with wide screen TV, a small sitting area and a bar. Wi-Fi is available. The barge also has a beautiful large sundeck, where the meals of excellent quality can be served if the weather is fine. On nice evenings or while cruising you can enjoy the scenery from here. The whole barge has central heating.